Sesame seeds is one of the most used seeds in India especially in Tamil Nadu. We call sesame balls recipe as ellu urundai recipe in Tamil. We use sesame oil widely in Tamil Nadu. In most of the houses, chutney is a staple recipe along with sesame oil. Sesame oil is called as Nalla ennai in Tamil which means Good oil in English. Sesame has one of the highest oil content when compared with other seeds. 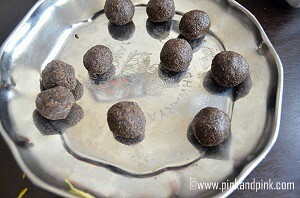 I have tried different methods to make sesame balls aka ellu urundai. I find the below sesame seeds recipe a very easy one. It is also a no fail recipe. Just make sure that you use high quality pure jaggery. If you feel that your jaggery has more dust and impurities, you have to add a very little water just to immerse jaggery and boil it. Filter and strain the impurities. Add this jaggery syrup with sesame seeds while making the powder and follow the same recipe. You might not need to add ghee too. For a 100-gram serving, dried whole sesame seeds are rich in calories (573 kcal) and are composed of the following - water - 5%, carbohydrates - 23%, dietary fiber - 12%, fat - 50% and protein - 18%. copper - 163%, manganese 45%, calcium 35%, magnesium 32%, phosphorus 32%, iron 29%, zinc 25%, molybdenum 24%, selenium 23%, vitamin B1 23%, fiber 17%. Also check healthy snacks for kids. Hope you are convinced why sesame seeds are very good for health. Even ayurvedic doctors prescribe sesame seeds for hair related problems. Sesame seeds are beneficial for women with menstrual problems. You can include whole sesame seeds in various ways. You can add the seeds while making chapathi. You can add in your salad. You can dry roast and powder it. Keep it an air tight container. Just add it with butter milk or yogurt. There are 3 types of sesame seeds available. Black, white and red sesame seeds. Black and white sesame seeds are quite popular and available widely. Black sesame seeds is the best in nutrition. White sesame seeds comes the next. Sesame seeds are hard to digest. So, it is better not to give after evening time. You can make approximately 10-12 medium size Til ke ladoo if you follow the same measurements. 1. Dry roast sesame seeds in low heat till they start popping a little. You will also get a nice smell. Switch off the stove and allow the seeds to cool down. 2. 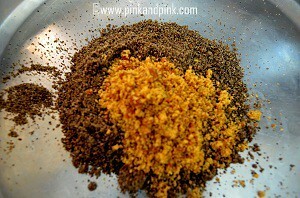 Powder it in a mixie and transfer it into a wide mixing bowl or a plate. 3. 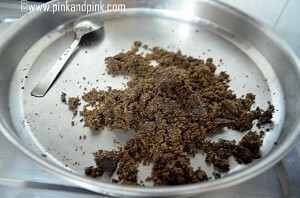 Add 50 grams of powdered jaggery first with the powdered sesame seeds. 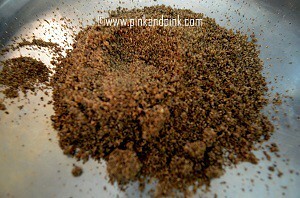 Taste and add more jaggery powder till you are satisfied with the sweetness. 4. Melt ghee in a pan. Add this to the sesame seeds and jaggery mixture little by little. Keep mixing everything with a spoon. If you are able to get everything together to make balls, stop adding ghee. If you are not able to make the balls even after adding ghee, you can add little sesame oil. You can easily bind everything and make sesame balls. Limit yourself to 1 or 2 til ke ladoo per day. Do not eat more as it generates heat. You can add cardamom powder if you need. 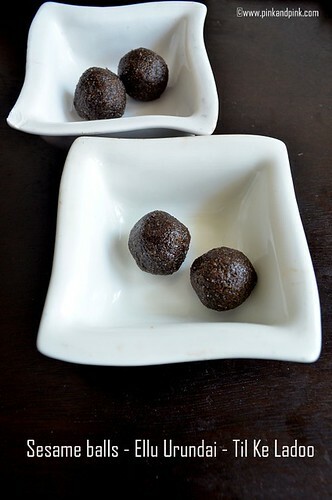 Hope you liked the recipe 'Til Ke Ladoo | Ellu Urundai | Sesame balls Recipe with jaggery'. If you find this post useful, share it. I love this. Ladoos are my favorite. Thanks for the recipe.